PFLAG Santa Cruz County is proud to announce that our Tuesday, June 12th meeting will feature the TRIANGLE SPEAKERS! 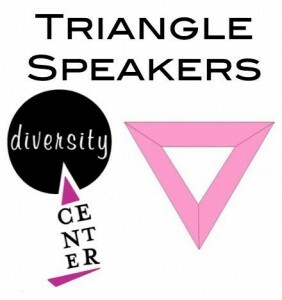 Please join us for a Triangle Speakers panel presentation with a Q & A to follow. The Triangle Speakers of Santa Cruz County train community members to become speakers who then sit on panels to speak from their own personal experiences in order to dispel myths and stereotypes of the Lesbian, Gay, Bisexual, Transgender, Intersex, Queer and Questioning community. Each panel consists of a lesbian, gay, bisexual, transgender, and allied individual. They host panels across Santa Cruz County (as well as neighboring cities) in middle schools, high schools, colleges & universities, businesses, and many other organizations.